‘U&I Together We Can’- Art And Artistes (I) Pvt. Ltd Initiative in association with the United Nations, enthralling musical performance which took place yesterday. Indian classical music duet performance was presented by both the genders, sharing the same platform by creating a mystical conflict through ‘Jugalbandhi’ in rhythm, beat and music. Renowned artists like Dr Ashwini Bhide Deshpande, Pt. Sanjeev Abhyankar, Rimpa Siva, and S. Swaminathan performed on stage. 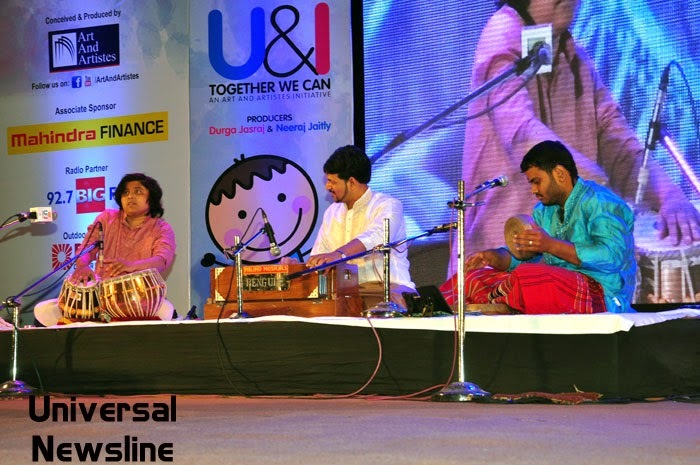 ‘U&I Together We Can’ is an Initiative created by Durga Jasraj and Neeraj Jaitly to showcase gender equality through music.The objective of this Project was to spread the message of gender equality, using entertaining Music performances by male-female duets. The series of Concerts across the World will help people realize that every child, be it male or female, is blessed with a distinctive quality, hence should be given an opportunity to rise and shine in their chosen field. ‘U&I Together We Can’ has been conceived by Durga Jasraj and Produced by Durga Jasraj and Neeraj Jaitly.